He has earned post-graduate degrees in engineering, physics and development economics from Cambridge University (UK), Massachusetts Institute of Technology (USA), and McGill University and Concordia University (Canada). Prof. Munasinghe has also received several honorary doctorates (honoris causa). Highlights from 40 years of distinguished public service include working as Senior Energy Advisor to the President of Sri Lanka, Advisor to the United States Presidents Council on Environmental Quality (PCEQ), and Senior Advisor/Manager, World Bank. He has taught as Visiting Professor at several leading universities worldwide, and won many international prizes and medals for his research and its applications. 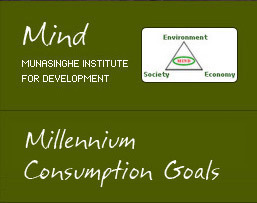 Prof. Munasinghe has authored 110 books and over 400 technical papers on economics, sustainable development, climate change, power, energy, water resources, transport, environment, disasters, and information technology. He is a Fellow of several internationally recognized Academies of Science, and serves on the editorial boards of over a dozen professional journals. "Highest National Order and Distinction of the French Republic to Prof. Mohan Munasinghe"